Smokin'! 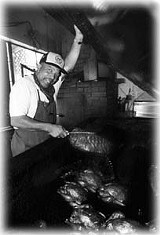 Donnie Harris keeps the home fires burning at Pack Jack Bar-B-Que Inn in Sebastopol. THERE ARE THOSE who feel that our fair county should really be described as 'Whine Country' because the choices of eateries are too diverse, too numerous, and too excellent to decide upon for just one short meal, one long evening, or one middling afternoon. There are the fares of every country, the straight-ahead mashed potatoes wish-I-was-in-jammies diners, the seven-fork dinners, and all of that damn good dead grape. But amazingly, day after day, county residents get up, gird their loins, loosen their belts, and foray out for yet another excellent meal. Poor us. Many among the thirsty throng of veteran beer drinkers slinging 10-ounce tasting glasses at the Luther Burbank Center proclaimed the Beer Fest the best event of its kind. Although billed as a "tasting," this hoppy-go-lucky fiesta is made possible by pure, raw party spirit. Last year, the love of drink motivated 1,000 beer nuts to part with 20 bucks each. This collective act of charity meant $12,000 for Face to Face, Sonoma County's high-profile AIDS relief agency. Determined to downplay the specter of mass inebriation and to educate the public about quality beer, organizer Lynn Newton says this year's fest features the "Beer Fest Invitational Craft Brew Competition." The results of the contest will be announced as the party begins. "That way," Newton intones, "people will know what good beer is." We'll drink to that. Don't miss the Beer Fest--with 40 microbrews, food tasting, and rockin' tunes--Saturday, April 19, from 1 to 5 p.m., at the Luther Burbank Center for the Performing Arts, 50 Mark West Springs Road, Santa Rosa. For details, call 887-7031.--D.B. A certain writer we know claims there is a strong psychological link between ice cream sundaes with caramel sauce and single-propeller aircraft; oddly, whenever he thinks of one, he immediately has thoughts of the other. No doubt this arises from all his youthful weekends spent slurping iced dairy products with his dear old dad while watching deft aeronautical maneuvers from a little diner at the postage stamp­sized airport near their home. It's a good thing for him that he now lives so near to the Two-Niner Diner out at the Petaluma Airport. Like something out of the TV show Wings (or even Happy Days), this unique diner boasts an old-fashioned ice cream counter, lots of airplane stuff on the walls, and big windows, from which sky-watchers have a clear shot of the unusually long runway and all the thrilling gravity-busting activity that takes place thereon. And the caramel sauce, we hear, is heavenly. 561 Sky Ranch Drive, Petaluma. 765-2900.--D.T. The salty carnal essence at the bottom of a roast pork burrito at El Favorito Taqueria in Roseland is enough to make you squirm with pleasure in your hard orange plastic seat. The low prices, big portions, and fabulous food--fast not fancy--makes El Favorito an underground cult favorite. Located at the unimproved site of a former Church's Chicken, this fast-moving taco shop is a no-frills, cheap-thrills Mexican food mecca. Clearly, not one centavo of your $3.60 super burrito goes to gratuitous interior design. Call out your order over the blaring jukebox. Eat salsa from a plastic cup. Read a menu board that blatantly identifies "cabeza" and "suiza" as "beef by-product." Three minutes from downtown Santa Rosa. 565 Sebastopol Road, Santa Rosa. 526-7444.-- D.B. If you think pizza is defined as a disc of dough plied with tomato sauce, cheese, and pepperoni, then you must not have visited Pizza Gourmet. Here, you're just as likely to savor a pie bedecked with pesto or a lively green tomatillo sauce and accompanied with such rare fare as caramelized onions, roast chicken, and cilantro (the Acapulco); roasted garlic and red peppers (the Gilroy); or salsa, chilies, beef, avocado, and green onions (the Mexicana). These award-winning departures from the pro-forma norm are just part of an impressively diverse selection of pizzas that anchors a menu of more conventional pastas, salads, sandwiches, side dishes, and desserts. You can also create your own exotic combinations from a list of specialty toppings and sauces, plus seven cheeses and five meats. And, yes, pepperoni is an option. Pizza Gourmet, 7350 Commerce Blvd., Cotati, 795-8008; 1415 Fulton Road, Santa Rosa, 575-1677.--B.R. A long country block off Hwy. 116 near Forestville, Bruce Goetz's blueberry farm is a genuinely rustic enterprise. His six acres of berries have been growing happily at the edge of the coastal fog zone ever since 1940, when his grandmother started the first commercial blueberry plantings in California. For a few short weeks each summer, they become a magnet for blueberry lovers from far and wide who converge on the farm to carry off baskets, boxes, or flats of plump, fresh-picked berries. The selection of Goetz's own jams and jellies and baked goods, offered in the weathered barn-turned-store, is augmented by fresh blueberry ice cream in the summer and shelves of holiday gift ideas in December. The berries don't ripen at the same time each year, but you can get on a mailing list for an early warning, just by asking. Green Valley Blueberry Farm, 9345 Ross Station Road, Forestville. 887-7496.--B.R. Not many places have a whole menu section dedicated to specialty polentas. But the Willow Wood Market Cafe is one of a kind. Despite a yup-scale selection of gourmet grocery items, this is a neighborhood hangout with a west county flavor, smack dab in the heart of downtown Graton. "The town was in need of it," says co-owner and head chef Matthew Greenbaum, who admits he's been surprised by the way the cafe has taken off in its first year and a half, quickly outstripping the market side of the operation. Regulars, who know to give way during high-volume mealtimes, when soups, sandwiches, and hearty breakfasts take over, can nurse a cappuccino for hours in between. The outdoor patio in back is a hidden oasis in good weather, too. Willow Wood Market Cafe, 9020 Graton Road, Graton. 823-0233.--B.R. All the way from Egypt, Texas, Donnie Harris appropriately named his Sebastopol rib joint Pack Jack's after the family mule--this man is stubborn about barbecue. Here you get ribs and chicken, beer, wine, and sweet potato pie, all strictly Texas style. And that means a deep-pit barbecue. A firebox stoked with oakwood cooks the meat with smoke and heat. This precious hole-in-the-wall is all country, pure cowboy. Grampa's "shopping list" hangs high on the wall; it's an antique single-shot shotgun. There's a pistol, a whip, a bull-riding rig, and an autographed picture of rodeo stud Joe Beaver, calf-ropin' champion of the world and a regular customer. Harris' BBQ sauce is the same recipe that's been used since the days of slavery. "If it wasn't used 200 years ago, then we don't use it today," he insists. "Poor people are always the best cooks because they have to be innovative to make food really delectable." Pack Jack Bar-B-Que Inn, 3963 Gravenstein Hwy. S., Sebastopol. 829-9929.--D.B. "Are we dining out today?" shouts Ralph Morgenbessen, downtown Santa Rosa's hotdog merchant par excellence. The recipient of this effusive greeting, an approaching customer still crossing the street several yards away from Morgenbessen's unmistakable hotdog cart, responds by shouting his order: two giant turkey dogs, no sauerkraut. Ralph's Courthouse Classics, as the Brooklyn-bred Morgenbessen has named his thriving wiener biz, has for four years been a popular fixture at Courthouse Square (corner of Mendocino and Fourth). Aside from the fresh, steaming, New York­style dogs--beef, turkey, polish sausage, and Louisiana hot links, with all the fixings gleefully offered--Morgenbessen's regular clients come for the man himself. Jovial in the extreme and able to engage almost anyone in conversation, he routinely--and this is no mere hyperbole--turns a quick lunch on the run into a warm, good-humored event. "I came to the Bay Area in '64," he will tell you, if you ask, and possibly if you don't. "Just in time for the Summer of Love. The only problem with Californians is they're too spoiled by the weather. In New York, you could sell a hotdog on a rainy day, but not here. It's a good thing there are so many gorgeous days, am I right?" Oh, and one more thing. "You want sauerkraut with that?"--D.T. So you like keeping up with Germany's beautiful people while munching a bagel and sipping coffee. Then Sawyer's Books--which has been keeping locals informed for over 50 years--is the place to order your next cappuccino. There's a new coffee cart in place, featuring a tasty northern Italian blend. Order coffee and enjoy browsing some 1,700 magazines and dozens of newspapers from around the globe at this popular downtown newsstand. And the user-friendly establishment allows readers take a peek at their magazine of choice before plunking down their cash. It's an honor system that works. Indeed, dedicated patrons have been known to straighten magazine shelves after their messier, newcomer counterparts. And for coffee drinkers who prefer sitting down, there are sidewalk tables, and plans call for a few inside tables. Sawyer's Books, 638 Fourth St., Santa Rosa. 542-1311--S.P. Less money than therapy and tons tastier, too. Burn off that heavy work-a-day stress with an order of spicy Thai food--hold the chairs. Take a load off at the Thai House in downtown Santa Rosa in the cozy, traditional sit-on-the-floor section. Remove your shoes. Grab a pillow. Take some time. Relax in subdued lighting, warm carved wood paneling, and plucky sonorous tunes from Thailand. Cold Thai beer washes garlicky sautéed eggplant, coconut milk soup, and a side order of peanut sauce. Sneak a catnap between bites. 525 Fourth St., Santa Rosa. 526-3939.--D.B. There are those who simply don't realize that line dancing goes back much further than the receding follicles on Garth Brooks' hairline. Heck, it's all Greek to those folks. As well as it should be: it's all Greek to the folks at Papa's Taverna, too. With Greek food and Greek dancing on Sunday afternoons, this hidden gem in the rough, weedy areas alongside the Petaluma River fairly bounces on Sundays with dressed-up folks holding hands with strangers, moving their legs in slow rotations before them, and hopping elegantly to the left. Or is it to the right? The music is live, the food is lively, and there is a small tucked-away outside patio just in the perfect spot for afternoon sun and late-day sunsets that can't be beat for sitting, sucking the meat from Kalamata olives, forking into the crumbly richness of a slab of fresh feta cheese, and mulling the lemony-ricey goodness of a homemade dolma while watching industrial types work on their docked boats. No wonder the Romans came and stole it all. 5688 Lakeville Hwy., Petaluma. 769-8545.--G.G.